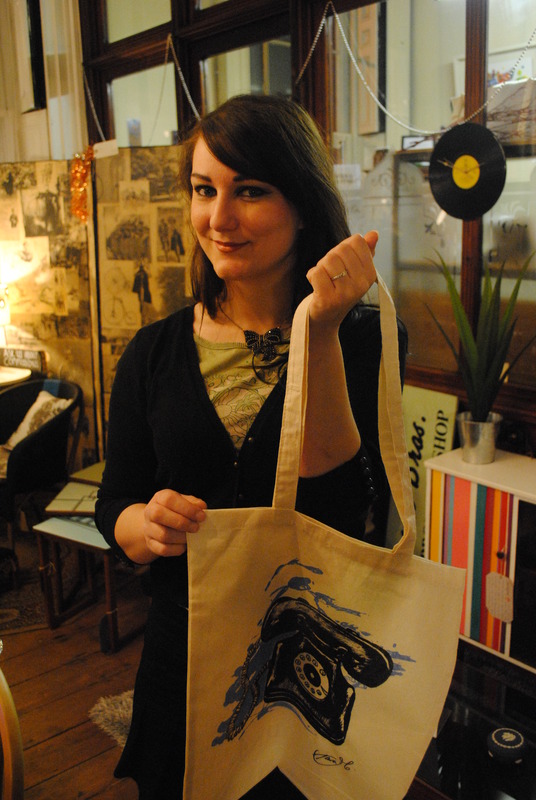 Meet Tara McNeill – the second of our tote bag design competition winners! Our bespoke designed, hand screen-printed ReFound bags have now been printed and perfected and are available to pick up in store and online! (click here) To celebrate the winners of our competition to create a bespoke design for the bags based around a ‘refound’ theme, we’re catching up with them to find out their inspirations and the story behind their ‘refound’ design – this time we meet up with Tara McNeill, the creative hand behind the gorgeous ‘ReFound Telephone’ bag…. 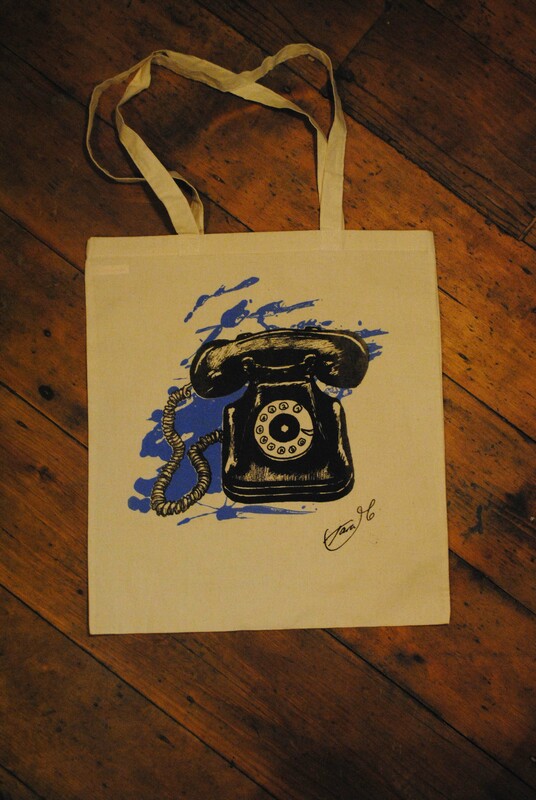 Tara McNeill & her wonderful ‘ReFound Telephone’ Bag…. Tell us a bit about yourself Tara…. I’m a graphic designer by day and an artist and illustrator by night. Art and design have always been my passion in life since I was old enough to hold a pencil. I specialise mainly in painting portraits. I also love to recycle old clothes and jewellery. A friend of mine told me about it and I thought it was a great opportunity. I created a piece for ReFound once before and loved getting involved. I remembered how a friend of mine who loves all things vintage has an old telephone sitting in her living room. I find it fascinating how everyday objects from the past have turned into objects used for décor purposes now. Reusing & recycling saves so much money and resources and also stops wastage. The end result is often far more unique and far better value than anything you would buy brand new. That old forgotten objects can be brought back to life if you just use a little imagination and that refurbishing your home doesn’t have to cost a fortune if you’re willing to recycle. Do you have a favourite object at ReFound? The Loving Spoonful Jewellery range by John Bird, made from recycled spoons. A big thanks to Tara for her beautiful design, it’s a true reminder of how stylish & chic everyday objects were in the good ol’ days! Check back for the next post on Esme & Bill Edwards’ fabulous ReFound Bag…..